As the FAA moves ahead it with its plans to decommission about one-third of the existing network of VORs in the continental U.S. (for more information, see Another Update on VOR Decommissioning and its related posts), a new type of navaid–a stand-alone DME facility–is appearing on aeronautical charts. Here’s an example southwest of Las Vegas, NV. Note the identification and frequency box for the GOODSPRINGS DME (GOG). The site of the transmitter is shown by the small blue box indicated by the red arrow. You can read more about these stand-alone DME facilities in DME Facilities – Charting and MAGVAR Issues (PDF), which describes the discussions of the Aeronautical Charting Forum, an FAA-industry group. These stand-alone DMEs are primarily for use by aircraft with DME-DME area navigation equipment, and in many cases, they are left over when the VORs they were associated with are shut down. Where necessary, new DMEs will be added to support RNAV procedures based on DME-DME as an alternative to GPS. As you can see from the chart, these DMEs do not provide azimuth (course) information like a VOR-DME or VORTAC. They are simply DMEs. If, like most IFR pilots flying typical GA aircraft, you use GPS as your primary navigation source, these charted stand-alone DMEs are of most interest as fixes that you can include in a route or flight plan. If you still have a DME receiver in your airplane, you can tune, identify, and reference these DMEs as you fly. The release of updated operating software for Garmin GTN-series avionics brings new capabilities to many typical general aviation pilots who fly under IFR. One of the new features is the ability to fly curved radius-to-fix (RF) legs on some instrument approaches. For more information about RF legs, see RNP Procedures and Typical Part 91 Pilots and Garmin Radius to Fix Leg Project Report here at BruceAir. For additional background on GPS navigation and RNP procedures, see also Updated AC 90-105A. …The Garmin GNSS navigation system complies with the equipment requirements of AC 90-105 and meets the equipment performance and functional requirements to conduct RNP terminal departure and arrival procedures and RNP approach procedures including procedures with RF legs subject to the limitations herein [emphasis added]. GTN Moving Map, EHSI Map, or Distance to Next Waypoint information must be displayed to the pilot during the RF leg when flying without the aid of the autopilot or flight director. AC 90-105 states that procedures with RF legs must be flown using either a flight director or coupled to the autopilot. This STC has demonstrated acceptable crew workload and Flight Technical Error for hand flown procedures with RF legs when the GTN installation complies with limitation set forth in Section 2.12 of this document. It is recommended to couple the autopilot for RF procedures, if available, but it is not required to do so. See section 4.5 of this manual to determine if this capability is supported in this installation. At present, only a few non-AR approaches with RF legs meet the criteria in the STC and AC 90-105A. But RF legs could become more common on “standard” procedures to provide paths that offer better noise abatement, reduce airspace conflicts, and improve ATC efficiency, and pilots flying with GTN avionics (or similar navigators offered by other manufacturers) will be able to fly those procedures. FAA has published AC 90-105A – Approval Guidance for RNP Operations and Barometric Vertical Navigation in the U.S. National Airspace System and in Oceanic and Remote Continental Airspace (PDF available at the link). This update to the previous edition (published in 2009) contains many important changes for pilots who use GPS to navigate under IFR. FAA is gradually adopting the concept of performance based navigation (PBN), which includes the old systems of area navigation (RNAV) and refines details of required navigation performance (RNP). For more details about these standards, see AIM Section 2. Performance−Based Navigation (PBN) and Area Navigation (RNAV). FAA now plans to transition from a legacy network of 967 VORs to a MON of approximately 500 VORs by FY2025. That’s a slip of five years from the previous goal of establishing the MON by 2020. 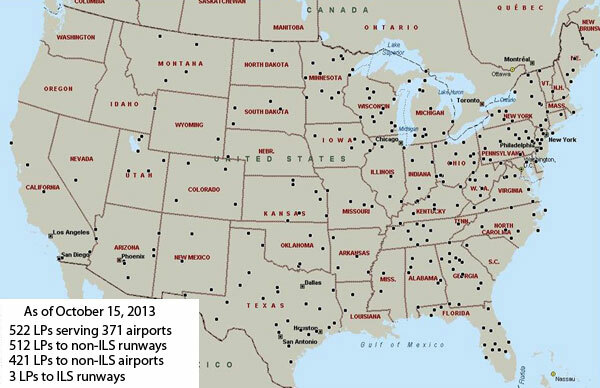 For more background, see the FAA’s VOR Minimum Operational Network (MON) Information Paper (PDF). The number of VORs comprising the MON may increase or decrease depending on the requirements for the Department of Defense and the Tactical Operations Committee. dFAA plans to require that all flight plans (VFR, IFR, domestic, and international) use the ICAO format sometime in the fall of 2017 (for the latest details, see this notice). For more information about the switch to ICAO flight plans, see a news item from AOPA here. A detailed explanation of the ICAO flight plan form is available here. Flight Service also has a handy tip card here and more details, including links to videos, here. In November 2013, FAA updated and simplified some of the requirements for filing ICAO flight plans for domestic use. You can read about those changes here (PDF). Note that the instructions from FAA focus on the printed flight plan form, which few pilots use. Apps such as ForeFlight, Garmin Pilot, WingX, FltPlanGo, go FlyQ take care of many of the details for you. You should review the user guides and other instructions for the apps and web-based tools that you use to file flight plans. ForeFlight has detailed information about ICAO flight plans here. Many pilots are confused by elements of the ICAO flight plan format, especially the multiple aircraft equipment codes that you must include to inform ATC of the gizmos and capability that are installed in your aircraft. Garmin has posted detailed information about the ICAO codes for its avionics, including a handy Microsoft Excel worksheet, here. Here’s a look at the relevant parts of the ICAO flight plan form as shown on the Leidos FSS website. You can find a video that describes the ICAO flight plan form at Leidos FSS here. I’ve filled in the information for my Beechcraft A36 Bonanza (ICAO identifier BE36), which is equipped with a GTN750, a Garmin GTX 327 transponder (not Mode S), and the GDL 88 ADS-B transmitter and receiver. This aircraft also has a Bendix/King DME receiver. For more information about the ICAO identifiers to use for the makes and models of aircraft that you fly, see ICAO Aircraft Type Designators here at BruceAir. The example is for an IFR trip from KBFI to KGEG in the Pacific Northwest. The route includes the ZOOMR1 STAR into KGEG. On the familiar FAA domestic flight plan form, equipment suffixes for typical GA pilots are simple, and if you’re flying a GPS-equipped airplane with a Mode C transponder, the basic /G was all you needed. But the ICAO form captures many more details about the equipment installed in your aircraft, and the fun typically begins with this item. S: Standard communication and navigation receivers/transmitters (VOR, VHF communications radios, and ILS receiver). If you enter S in this box, you shouldn’t include the letters L (ILS), O (VOR), or V (VHF) here. S includes that equipment. B: LPV approach capability. If you have a WAAS GPS, but your installation isn’t approved for LPV procedures (see the user’s guide and AFM supplement), omit this letter. D: DME. If you don’t have DME, omit the D.
R: PBN approved. This letter means that your aircraft meets basic RNP standards. All aircraft with an IFR-approved GPS are PBN approved (see AIM 1-2-1). You must include R, and associated information in the Other Information box, to ensure that the computer will accept a routing that includes RNAV routes, SIDs, STARs, or charted ODPs. See PBN and RNP Confusion, below. Z: Indicates additional information to be added to the Other Information box, described below. If you still have an ADF, include F.
The aviation world uses RNP (required navigation performance) for two related, but different purposes. In general, RNP is an RNAV specification (e.g., RNAV 5, RNAV 2, and RNAV 1) that indicates that an aircraft is capable of maintaining a course (track) within designated limits 95 percent of the time. For example, RNAV 5 means the aircraft as equipped can reliably maintain a track with 5 nm; RNAV 2 limits are 2 nm, and so forth. If your aircraft is equipped with an IFR-approved GPS authorized to fly RNAV (GPS) approaches, it matches this sense of RNP and PBN. The basic RNP (RNAV) specifications used in the U.S. (RNP 0.3, RNP 1.0, RNP 2.0, and RNP 1.0) are shown in the following illustration from the Instrument Flying Handbook (FAA H-8083-15B). For more information about RNP and RNAV specifications, see “Required Navigation Performance” on page 9-44 of the IFH. Current WAAS-approved GPS receivers for typical GA aircraft, such as those listed earlier, meet the U.S. RNP specifications, as described in AC 90-100A: U.S Terminal and En Route Area Navigation (RNAV) Operations and the associated AC 90-100 Compliance document (PDF). To confirm your GPS receiver’s capabilities, check the user guides and the AFM supplements for the equipment installed in your aircraft. The term RNP is also applied as a descriptor for airspace, routes, and procedures (including departures, arrivals, and IAPs). RNP can apply to a unique approach procedure or to a large region of airspace. In this sense, RNP means something similar to Category II and Category III instrument approaches. For example, an approach with RNP in the title (e.g., RNAV (RNP) Z RWY 16R) requires special equipment and detailed crew training/qualification. Such RNAV (RNP) approaches include the note AUTHORIZATION REQUIRED on the chart. For more information about RNP approaches, see RNP Procedures and Typical Part 91 Pilots and Garmin Radius to Fix Leg Project Report here at my blog. This box on the ICAO form tells ATC what type of transponder and related equipment are installed in your aircraft. For most GA pilots flying IFR, this box will include at least C, for a transponder with altitude-reporting capability. If you have a Mode S transponder, you should select the appropriate letter, E, H, I, L, P, S, or X, based on the information in the user guide and AFM supplement for your transponder. If you have ADS-B equipment installed (not a portable ADS-B receiver such as the Stratus or Dual XGPS170), include U1 or U2. The Garmin GDL 88 in my airplane both transmits and receives ADS-B signals, so I add U2 to this box. The final box for designating your RNAV capabilities and additional data is Other Information. You must use prefixes, followed by letters, to include different categories of information. As described above here and here, it’s important to add a PBN/ group in this box to ensure that the ATC system understands the RNP/RNAV capabilities of your aircraft. For more information about the filing the appropriate codes related to ADS-B capabilities, see Filing for Advanced Surveillance Broadcast Capability (PDF) at the FAA flight plan website. You can also add a NAV/ group in this box to indicate your RNAV capability. This group isn’t necessary if you use the appropriate PBN codes described above. But you can use a NAV/ group such as D1E2A1to indicate that you have RNAV 1 capability for departure, RNAV 2 capability for the en route segment, and RNAV 1 capability for arrival. These groups and letters mean that you can fly RNAV routes (e.g., T-routes), RNAV SIDs and STARs, and charted ODPs (charted ODPs are often RNAV procedures, usually based on GPS). “Departure Procedures” in Chapter 10 of the Instrument Flying Handbook. Chapter 2, “Takeoffs and Departures” in the Instrument Procedures Handbook. Don’t worry about the options in the RNP Specifications part of this box. Unless you are authorized to fly RNAV (RNP) procedures (see above), these items don’t apply to you. Surveillance Equipment: C (for a Mode C transponder). (where xxxxxx is the six-digit hexadecimal code assigned to your aircraft as part of its registration record at the FAA). A new nonprecision WAAS approach, called Localizer Performance (LP) is being added in locations where the terrain or obstructions do not allow publication of vertically guided LPV procedures. This new approach takes advantage of the angular lateral guidance and smaller position errors provided by WAAS to provide a lateral only procedure similar to an ILS Localizer. LP procedures may provide lower minima than a LNAV procedure due to the narrower obstacle clearance surface. NOTE–WAAS receivers certified prior to TSO C-145b and TSO C-146b, even if they have LPV capability, do not contain LP capability unless the receiver has been upgraded. Receivers capable of flying LP procedures must contain a statement in the Flight Manual Supplement or Approved Supplemental Flight Manual stating that the receiver has LP capability, as well as the capability for the other WAAS and GPS approach procedure types. As noted above, you must have a WAAS-capable, IFR-approved GPS navigator to fly LP procedures. In addition, your unit must have the correct operating system software installed, and the supplement to your AFM must permit you to fly to LP minimums based on the equipment installed in your aircraft. At present, there are 413 Localizer Performance (LP) approach procedures in the U.S. The map below is a bit out of date, but it gives you a general idea of where these procedures are located. You can find lists of approaches with LP minimums at this FAA website. The information is in Microsoft Excel worksheets that you can filter and sort. This change updates guidance to specifically address the Global Navigation Satellite System (GNSS). This change describes the requirements for two independent navigation systems. It also clarifies the application of different Technical Standard Orders and updates the guidance for standalone GPS approaches. In addition, this change clarifies the term UNRELIABLE as used in conjunction with GPS notices to airmen. Document references have also been updated throughout the paragraph where applicable. This change incorporates verification of the assigned area navigation (RNAV) standard instrument departure (SID) to pilots prior to departure into the Aeronautical Information Manual and other Air Traffic publications. This change adds guidance for using “T−Routes” and “Q−Routes.” Document references have also been updated throughout the paragraph where applicable. 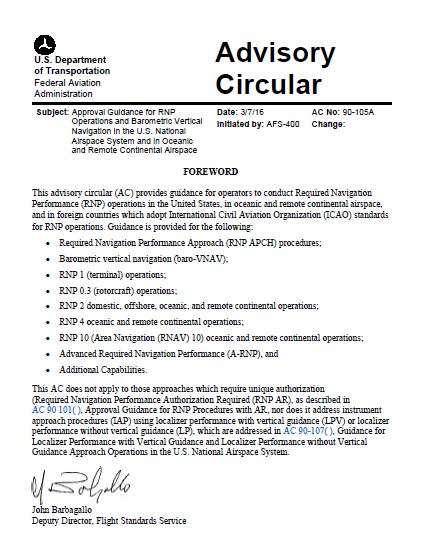 This change updates guidance regarding the Ground Based Augmentation System (GBAS) and updates document references where applicable.